Many women change their names after getting married, and some men are opting to change their names too. In most states, you can file to change your name along with your marriage license. Put the new name on your marriage license. The clerk may forward the information to the Department of Motor Vehicles and Social Security Administration, or you may have to send the information to them yourself. Many states allow both men and women to change their names using this method, but some states require men to pay an extra fee and file a formal petition for name change. After your marriage, check with these two administrations to ensure your name has been changed. If you are already married and wish to change your name, you may have to file a petition for name change in the appropriate court and advertise your proposed name change in a local newspaper. The simplest way to change your name during a divorce is to do it as part of the divorce proceedings. You or your attorney can add the request for name change to your divorce pleadings. The judge may then issue an order legally changing your name. In some states, this will be sufficient to accomplish your name change and you will only have to show the order to the DMV and Social Security Administration. In other states, you may have to file the order along with a petition for name change and then advertise your name change in a newspaper. Some parents wish to change their child's name because of an error on the birth certificate or to reflect the child's paternity. 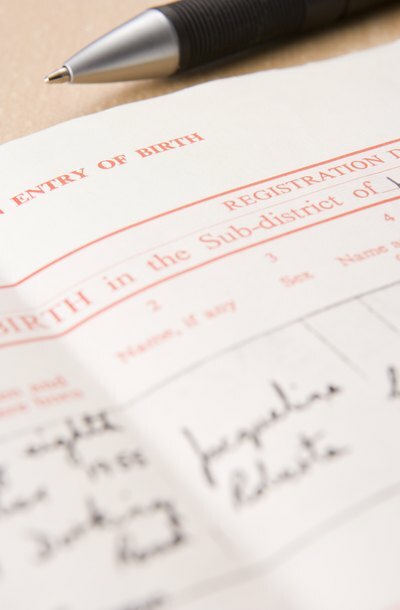 If you have the other parent's consent and your child is less than one year old, you may be able to file a birth certificate amendment form to accomplish the name change. If you are completely changing your child's name, however, you will have to obtain permission from the other parent -- or guardians if your child has them -- and receive a judicial order to change the name. You can accomplish this by filling out a petition for name change and having all guardians sign it. Then advertise the name change in a local paper. If there are no objections to the name change, your child's name will be changed when a judge issues a name change order. If you are changing an adopted child's name to your last name, this is typically done as a part of the adoption proceedings. Name changes in other circumstances follow the same basic procedure, but typically are not done as part of a marriage license, divorce or other judicial proceedings. File the petition for name change in the Superior or Family Court in the county where you live, then advertise the name change in a local newspaper. After the advertisement has run for a set period of time -- which can range from one week to several months -- a judge may sign an order for the name change. If someone objects to the name change, there will be a hearing. After you obtain an order for the name change, send the order to the DMV and Social Security Administration. When your name is changed with these governmental entities, the government will legally recognize your name change. However, you will still need to notify any places with which you do business -- such as doctors and health insurers -- and any people with whom you have contracts of the name change.